Fine Line Property Maintenance offers a wide variety of property maintenance services to the Rochester, NY area. Our team of professionals work hard to ensure that all of our customers receive the best service possible. We have a highly motivated and reliable staff with the skills needed to keep your property looking its best. Whether you're interested in snow removal in the winter, planting in the warmer seasons, or trimming the plants already in your yard, we have the knowledge and tools necessary to get the job done right. We even take the time to inform our clients about the types of plants native to our area, and the proper way to care for their landscaping. It is our dedication to our clients that truly sets us apart from other companies like us. 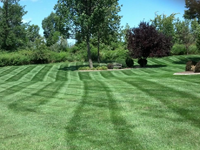 For landscaping services you can trust and friendly contractors you enjoy working with, call Fine Line Property Maintenance at 585-507-1075 today!